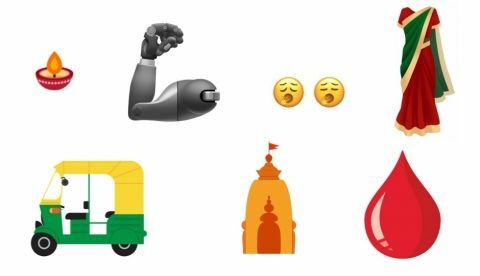 Upcoming new Emojis might include prosthetic arm, yawning face, men holding hands, women holding hands, sari, diya, hindu temple and more. Unicode Emoji version 12.0 final list is released. There are a total of 230 emojis in the list. Some of the emojis include men holding hands, women holding hands, pinching hand and more. If you are one of those people who like using emojis while texting, there’s some good news for you. Unicode.org, the consortium that develops, extends and promotes the use of the Unicode Standard has listed 59 new emojis that will soon be making their way to devices with the Unicode Emoji version 12.0. There are also 171 variants for skin tone and gender, bumping up the total number of new emojis to 230. Some of the notable new emojis include prosthetic arm, yawning face, men holding hands, women holding hands, pinching hand, kneeling person, interracial couples with varying skin tones among others. The Unicode consortium has also added sample images of the new emojis but says that smartphone manufacturers, PC makers, platform owners and websites use images that fit in with their own existing emoji designs. Additionally, this new emojis can be expected to show up in devices from September or October, but some platforms might release them earlier. “The new emoji will soon be available for adoption to help the Unicode Consortium’s work on digitally disadvantaged languages,” the consortium’s blog post states. Speaking of emojis, Twitter has announced that iit s rolling out a new interface for the web version of the microblogging website. The new interface will feature new additions like an upgraded trends space, advanced search, emoji button, quick keyboard shortcuts, among others. The company released a new video shared on Twitter, the new interface is depicted featuring a dedicated button in the tweet box that enables users to easily add an emoji. The updated trending section appears on the right-hand side of the page, and there is a cleaner interface that makes it easier to see the conversation.